I always appreciate songs that are simple enough for even me to figure out how to play on guitar. It's sort of like watching movies from the '40s -- forcing yourself to work around restrictions ends up making for more interesting fare. 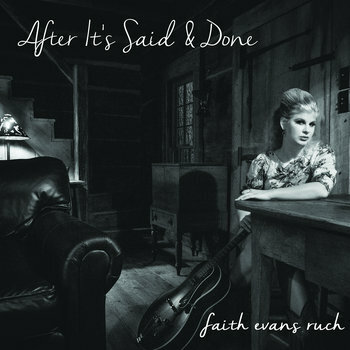 In Faith Evans Ruch's case, though, she could sing One Direction lyrics and she'd be captivating. Even better, the lady's an incredible songwriter. Ruch's voice belongs in the pantheon of greats. There's no better way to describe these songs than "timeless." Each song on this EP is carefully crafted and, frankly, perfect. Ruch really shines on her longer compositions, "Dream Come True" and "Thanks For the Song." Both of these songs shift in tone, tempo, and composition during their four minutes and change, but her storytelling transitions so gracefully you won't even notice 'til it's done. All with strum patterns and chords that this hamfisted wannabe can replicate. The only trick here Ruch's talent and disciplined craftsmanship. Easily one of my favorite albums of the year.